The module is available for you in Magento Marketplace. Latest version is downloadable as .zip file directly here. (you can also test out the module without signup, using test-shop credentials).It is necessary to conclude contracts with used suppliers for the use of shipping methods. Follow the regular Magento 2 extension installation procedure. 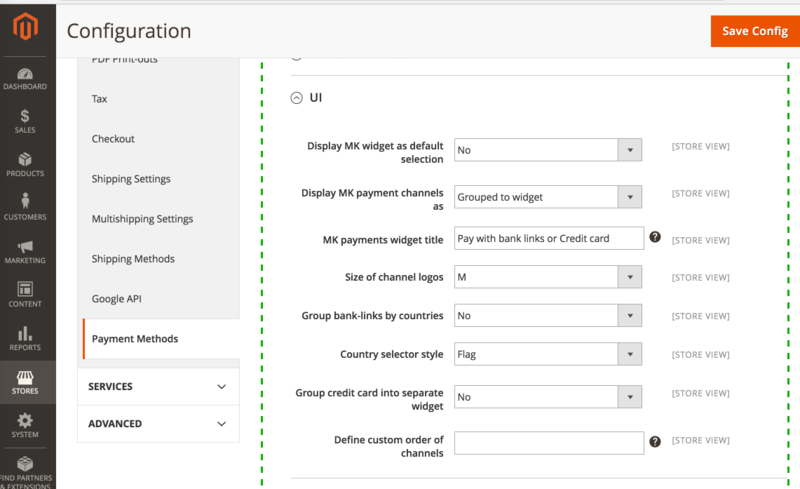 The module installation adds a payment method “Makecommerce” that you can enable and configure. First you need to put in Maksekeskus API credentials for your Shop. The API credentials are made available for you in the Merchant Portal of Maksekeskus. Note that we have also a separate Test Environment, and you may ask us to create also an account for you in the Test Environment. You can put into the Module configuration API keys of both Live and Test environments and switch between them. Widget – all methods are presented in compact multi-row block. This is the default way. List – each method provided by our module is presented on a separate row equally to other payment methods. 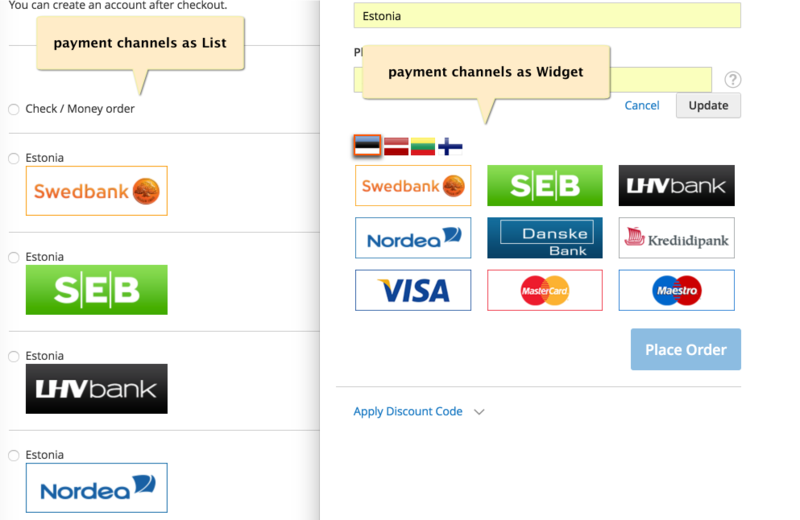 Use this option if you want to use only few specific methods provided by us and want them to be listed equally aside the other payment methods you may have in the shop. The widget of payment methods is responsive and changing the size of logos dynamically regarding the size of the place available. However you can slightly influence the size by selecting between S, M and L size setting. You may choose to place the credit cards a bit separately from the bank-links. Your list does not include all the channels, the rest will be then listed after yours. Our credit card payment dialog is built this way that the sensitive card data input goes in iFrame directly to our backend systems. The card data does not pass your systems and thus your systems are not subject to PCI DSS compliancy. You can also do refunds to payments made through our Payment Gateway right inside Magento store admin interface. You will find the “Refund” button in Credit Memo dialog of an Order’s Invoice. See more information about Refunds. The module installation adds a shipping method “Makecommerce” that you can enable and configure. 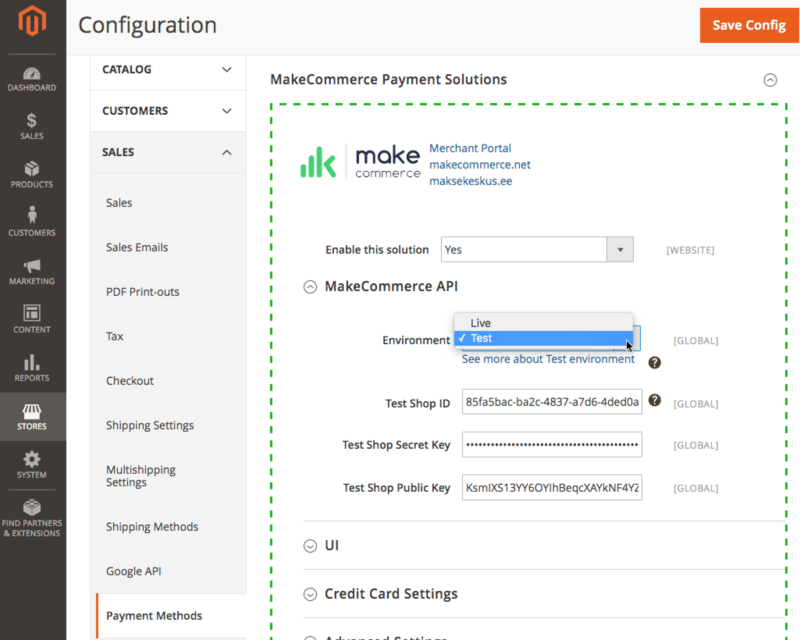 Go to Stores->Configuration->Sales->Shipping Methods to configure the MakeCommerce module. 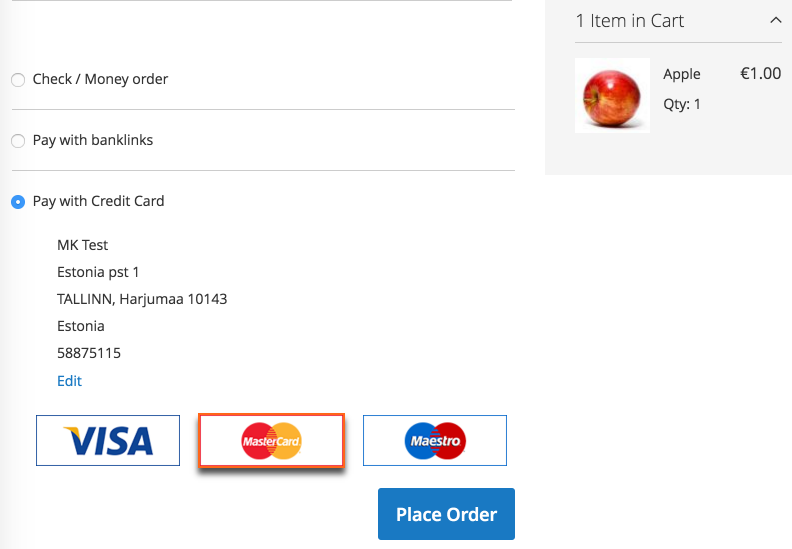 Similarly to configurating payment methods first you need to put in Maksekeskus API credentials for your Shop. The API credentials are made available for you in the Merchant Portal of Maksekeskus. 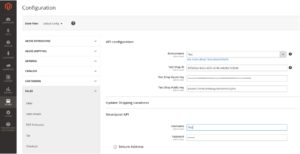 In your shop MakeCommerce Api settings are under Stores->Configuration->Sales- >Makecommerce API. Settings for shipping methods API are also found there. After inserting API credentials You can activate shipping methods here: Stores – >Configuration->Sales->shipping methods. After this a list of parcel machines is added to the store’s checkout page, which is always up to date (changes are reflected in the Omniva and Itella SmartPOST parcel machine and DPD Pick Up Network listings). It’s also possible to mark some of your products as “not suitable for Parcel Machine shipment”. Or mark that the product is entitled to free shipping in parcel terminal (if it is the only product in cart). The module can automatically create shipments into smartpost.ee and omniva.ee systems when the order has been paid. 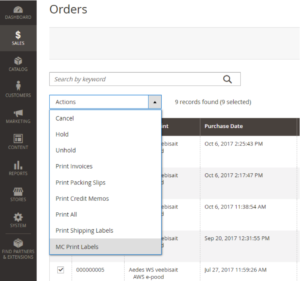 Once this automation is activated you can print out the package labels right form the shop administration panel (orders view). 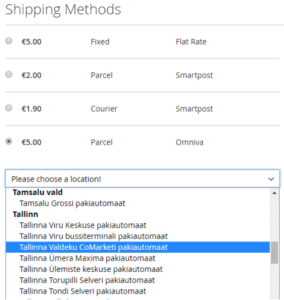 You can select all orders in processing state and with one click print out Omniva, Smartpost and DPD shipment labels mixed. If configured, the plugin will automatically create a new shipment in Omniva.ee system. The shipments going to parcel machine are created as “Parcel machine service” with “Parcel arrival SMS” and “Parcel arrival e-mail” (code PA+ST+SF). The service type is B2C – no manual work or confirming is needed (or even possible) in Omniva business customer e-service. You will see the shipments listed in omniva.ee e-service (under the list of shipments) only after they have physically handed over to Omniva. If configured, the plugin will automatically create a new shipment in smartpost.ee system when the order gets paid. You will see the SmartPost shipment number in order details. You can see the shipments created also in smartpost.ee self service interface. First you need to sign agreement with DPD. Once you have the agreement you need to ask DPD for Interconnect account (contact your account manager or sales@dpd.ee). Enter Interconnect user name and password into extension settings. After that the plugin is able to automatically register shipments to DPD system after the order has been paid through Maksekeskus MakeCommerce. Parcel labels can be printed from orders view. Call DPD for courier once you are ready to hand over the parcels.